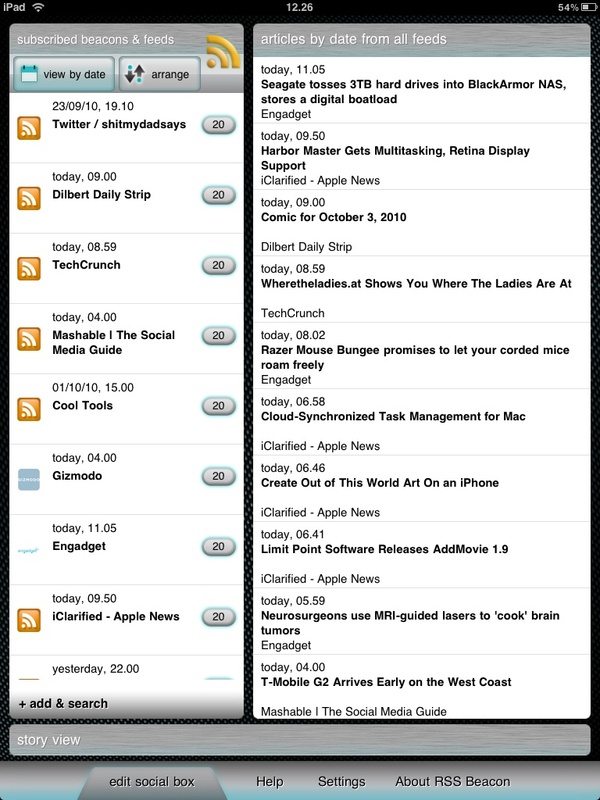 There’s a ton of RSS readers out there for iOS devices such as iPhone and iPad. RSS Beacon is somewhat just yet another RSS reader, but it has a few tricks up its sleeve. First of all, it has the social element, such as sharing to Twitter, e-mail etc., like most readers do nowadays, but RSS Beacon also comes with the “Beacon” sharing mechanism which allows you to create personalized feeds and invite your friends to follow them. The UI is pretty sleek and pleasing to look at it. Rolling headlines is a sure winner for those of you using the iPad more extensively than just picking it up to do a few things every now and then. RSS Beacon is $3.99 in the App Store. Personally, my favorite RSS reader for iPad is still Pulse. I bought it a while back but it just changed to a free app as they want to get more users and instead offer ads inside the app. I do, still, prefer Pulse but if it turns out to be too heavily loaded with ads, then RSS Beacon is definitely the app I’ll be switching back to! Try out RSS Beacon if you’re into the features it offers in order to differentiate itself from all the other RSS readers out there. What’s better about these than say Google Reader? I haven’t tried Google Reader on my iPad (or iPhone) yet. How does that work? I have not tried it on a iPAD but it works perfectly on a iPhone, though reading and commenting on Blogs using a iPhone is a chore. I think it is not up to the mark compared to other Readers. This one looks decent, like you said, the UI is pretty sleek. By comparison, this RSS reader app is great, there are plenty of pretty bad rss readers on the market right now..